Ryan Haines grew up in Zion Harvest Church with his parents and older sister. He is Zion’s first full time Missionary that we have “sent out” to do the great commission. Ryan became a Christian as a sophomore in college after God interrupted his life and showed him his need for a Savior. Early on, God gave Ryan a hunger for the Scriptures. As he studied, he began to grow in his understanding of the gospel message, and it became clear, that he had a responsibility to spread the gospel throughout the earth! Thus, a passion for missions and evangelism was birthed in his heart. 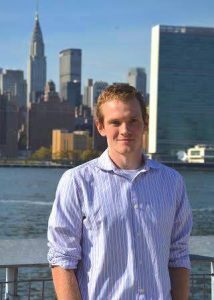 During his senior year of college, God called Ryan to Street Life Ministries, a missions organization in New York City www.streetlife.org, were he has been participating in global mission and street evangelism since graduating in 2013. Ryan is committed to the global success of the gospel. His zeal for evangelism is coupled with a passion to preach and teach the Word of God. Ryan is also a gifted bassist and music teacher. He uses those gifts in many outreaches and worshipping on the streets. Monthly Donations – You can help Ryan continue as a full time missionary by joining his monthly support team! All donations can be made by check or online. Please contact Ryan for specific giving instructions. Brazil Donation – Every year Ryan raises money for his trip to Bello Horizonte, Brazil to join local missionaries in their work to spread the gospel and bring women out of prostitution. Contact Ryan for specific giving instructions. Donate Airline Miles – Missionaries need to travel often. One way you can bless Ryan is to donate extra airline miles to help offset travel expenses. Speaking Opportunities – Ryan is always eager to share with God’s people. He would be happy to come speak to your youth group or congregation about missions and the work he is doing with Street Life Ministries. Spread the Word – Let other people know about the work Ryan is doing with Street Life Ministries!